This book came highly recommended it includes all sorts of stationary engines and inclines used in mining and slate quarrying, there many Colour and B&W Photos and plans. 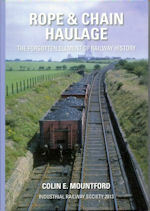 This exceptionally interesting book on the use of ropes and chain haulage to move trucks up and down inclines, from the very earliest days of railways up to the present day. The coverage of both the technicalities and the railways/inclines themselves is very detailed, and both ‘main-line’ and industrial use, in a plethora of gauges, is included. The bulk of the systems considered are British, but an number of other inclines, in India, Australia, New Zealand, Brazil and Rumania are described.